Ashley and I are ready for our first link-up of 2019! 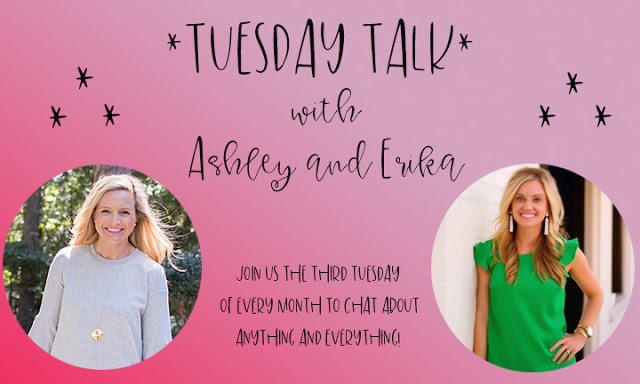 The third Tuesday of every month we invite you to join us to chat about ANY topic under the sun. My favorite posts are the kind where you participate too and we have a big girlfriend discussion. If you're a blogger, please mark these on your calendar! We'd love for you to join us! And then please come back and tell me about YOU...where do you live, do you have kiddos, what's your occupation, etc....? Basically, anything you'd love to share, I'd love to hear! This is a fun little community we're building over here and I'd love to know more about YOU! 2019 is gonna be a FUN year for A Little Bit of Everything. I hope you'll join us! Hey Erika! My name is Brittany, I'm a Mom to three little girls ages 5, 3, and almost 1! I live in the Chicago suburbs and stay home with my little ladies! We love baking, crafting, trying out ALL the parks and of course trips to Target :) We are SO excited for an upcoming Disney trip in May and I can't believe my oldest will be starting Kindergarten this year! Your "About Me" page was so fun to scroll through- I realized I've been following along with you since 2012, or maybe even a little before that! Whoa- where does the time go!? I remember at the time I loved finding Mom blogs to read because I was expecting my first baby and only had one other friend who had kids! It was so nice to be able to read and see what another Mom's day to day was like :) Thanks for sharing a little bit of everything, have a great day! Dang, I need to update my "About Me" page, it's just a paragraph! I love yours, it's such a sweet look at your family through the years. Hi Erika - My name is Eileen and I'm a 5th grade teacher. I have 3 beautiful girls (11, 7, and 5). I live in New York. I love spending time with my family, traveling, reading, and all things Disney. I've been reading your blog for a while now and I enjoy reading about your travels and mom life as our kids are similar ages. Hello. Rural PA. Three kiddos 3, 9 & 12. One is adopted. I am a bookkeeper and love your blog. I'm so glad you're hosting this link up again!!! Hi Erika! My name is Mandy and I’m from a small town in Missouri. I have a 5 year old daughter Stella and I work as a nurse and we farm. I started following your blog a few years ago and you planned our first Disney Cruise when my daughter was 2! I’m ready to plan another...we’re thinking Alaska this time! I enjoy reading other moms tips and tricks and journeys with infertility and that’s how I got started following you! Thanks for sharing! Hi Erika! My name is Julie and I blog over at Two Blues Fans. I'm a teacher turned banker who lives in St. Louis. Which small town in MO are you from? I started following you thanks to the what's up wednesdays link up. I love to travel so those are my favorite posts of yours. Hi! I am Paula. A stay at home, homeschooling momma. 42 this Friday. I started reading Shay's Conservative Mommy back 13 years ago when I was a new Mommy and had some time on my hands while he napped. Well, 4 kids and 13 years later, I think I lurk into the lives of all you girlfriends there in Texas that blog. I pretend I am one of the girlfriends too. I really want to come to a holiday recipe exchange party or maybe next NY trip? 🤣🤣🤣 Seriously, I enjoy the break from my reality (13 yo, 11 yo with severe disability with seizures, non verbal, no walking and 8yo twins) and peek into how others are doing. I love all the tips from life hacks, gadgets, clothes, how you "do", recipes...it all. I don't respond daily, but I read every post. I pray, laugh & clap with all of you Mommies! Hi! I am also from the Show me state and love meeting people from there. What town are you from? We currently live in Ohio and I miss Missouri! Hi Erika! I'm Heidi and I live in Holland,Mi. I am married, no children only a spoiled pug. I work in a nursing home. Your blog is one of my favorites to follow! Hello, new friends!! I'm Jill, and I blog at Jillonthehill.com. I live in chilly Wisconsin and I live vicariously this time of the year thru Erika and Shay and their warmer temperatures! Ha! I have 4 mostly grown kiddoes, a hubby of 28 years and 2 fur babies. Did I mention that I'm a Grandma? Oh, it's just the best!! I love hot chocolate, easy recipes and my Jesus!! Hi Erika! I am an empty nester who recently moved from Michigan to Florida. I have 2 daughters, 25 and 28 and the older got married this past summer (so much fun!). We are young retirees who love everything about Florida and how you can be active year around. My new favorite thing is yoga on the beach. I love your football related posts, because I am a huge college football fan (Michigan State alumnus). Enjoy reading about your sweet family and the Dallas area where we lived for a time. Hi Erika! Your about you catch up was so much fun! Wow, I have been reading for quite a while. I am Kelly, we live in Collierville, TN (Memphis area). We have two great kids, our daughter Parker is 15 and our son Grant is 12. I am a senior contracting analyst for medical device company, that is a fancy way of saying I am the "pricing police" and reminding people we are a "for profit" company. :) Enjoy your young kids, they grow up way too fast! We are teaching our "baby girl" to drive and will soon be looking at colleges. GASP! A little side note, our daughter was born with a cleft lip and has had 9 procedures/surgeries to date. Our son is all boy, all the time. Fortunately, our kids get along quite well. Hi Erika! So fun reading about you--and reading all the comments from all over the place! I live in the suburbs of Minneapolis and have a 2 and a half year old daughter. I'm a communications manager for a medical device company and reading your blog and Shay's blog is a must before I dive into my busy workdays. I love hearing about your life and your family. I regularly tell my husband about things I hear from "my blogger friends in Texas" (at which point hubby rolls his eyes), but I just know we'd be friends if we lived nearby! ;) Thanks for taking the time to do this blog. As a former blogger (pre-marriage and kid), I know takes work (in between the fun)! What a fun recap of your last few years. As a fellow infertility warrior, I love all of the surprises that came in His time. I'm Sara, and I blog at www.saraleeblog.com After 3 years of infertility, 6 failed IUIs, and one successful IVF, my hubby, Lee, and I welcomed our miracle boy October 2017. We also dreamed of family pumpkin patch and beach pictures <3. We are college sweethearts and live in Southern, IN working as a proposal manager for a construction company and community college professor. We are now praying for baby number 2, and knowing that His timing will be PERFECT. I love following along with your family, and joining fun link ups such as these. You have definitely motivated me to go and check out my About me page!! Love yours! So fun to take a look back at how things change over the years! Hi Erika! I'm a long time reader from Houston. I have two teens - a 16 year old daughter and 15 year old son. Love your blog! I love this.. and it totally motivated me to update my "about Me" page too... though after reading yours I think I could probably add even a few more details about myself. Like that my high school sweet heart and I bought our first home together before either one of us was even of legal drinking age (a fact I remember vividly since we had to get my mother in law to pick some up for us).. and were married and selling that very home less than two years later... just a few little tid bits like that. Hello, I am a SPED teacher in the San Francisco Unified School District and have two kids (almost 23 and 21). I just like going out and enjoying the world. Thanks for hosting and I hope that you have a wonderful week. Wow! Loved reading the About Me update! Cute format for it! Hi Erika! I’m a stay at home mom in NW Ohio. We have 3 boys ages 10, 4, and 2 and my beautiful 15 year old stepdaughter. I grew up in a small college town and after meeting my husband moved out to the country close to where he grew up. We, and I use that term loosely — it’s mostly my husband, farm. We also breed and raise our own pigs and sheep and raise cows and chickens for meat, and I take care of most things on that end of the farming. I’ve been reading yours and Shay’s blogs for close to 2 years now. The urge to start a blog comes and goes but has been almost constantly on my mind for the past few weeks. Any words of wisdom or tips (or even warnings😂)? Thanks for inviting us all in to your lives!